The love month is not just about romance and relationships, it is also about love for the most important person and that is YOU. So for the love of yourself, Happy Day Rauch Orange got tips that will refresh your habits and will spark motivation of investing in yourself with food and fitness as the beginning. 1. Don’t skip meals and suppress your hunger. Just because you’ll be having a grand buffet or multi-course sit-down meal, never starve yourself the entire day and go all out to the dinner table. This habit leads to overeating, filling your plate with caloric food choices. It is always a good idea to grab a fruit, cereal, oatmeal or whole wheat bread before heading to the gathering so you won’t arrive feeling ridiculously famished. 3. Move and stay active. We are not new to the temptations and nostalgia of the love month without feeling stuffy, that’s why planning your schedule is always the first way to go. Achieving seven to eight hours of sleep is a sanity-saver and gives you a clearer, calmer mind. In fact, the ghrelin hormones increase when you’re up past your bedtime, while leptin or the hormone that tells you when you are full decreases with lack of sleep, which means a major wreak havoc to your diet. 5. Strengthen your immune system with Vitamin C.
The last thing we want to happen is catching a bug in the form of cough, colds, or flu, so make sure to give your immune system the boost it deserves. The antioxidant Vitamin C, which helps to ward off communicable diseases should be part of our healthy lifestyle. Note that our body lacks the ability to produce Vitamin C, so it’s therefore important to get it from the right sources like Rauch Happy Day Orange Juice. 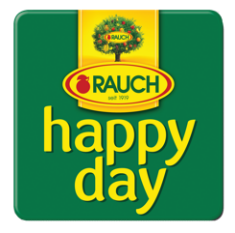 A European brand that’s in tune with the taste of our time, every 1L pack of Rauch Happy Day Orange Juice contains 16 high-quality and sun-ripened oranges giving it a zesty and refreshing taste. Each glass is enough to meet your body’s required daily dose of Vitamin C. Much more if you’re looking for ways of curbing your sugar cravings, a sip of something sour or tart like orange juice will help.